Another week and now its time to close out this series on how to solve the 9/15/13 Sunday Funday challenge. Also this is my 100th Daily Blog post! Woo! Only 252 to go! Oh man I should not have typed that out, one blog at a time dave ... one blog at a time. If you haven't already you can download the image this solution is based on here. So as I close out this solution series remember to always be thorough you never should think your suspect had a simple executed plan with only one exit. On to CD Burning detection. And there you go, Acme.zip was burned to a CDROM. 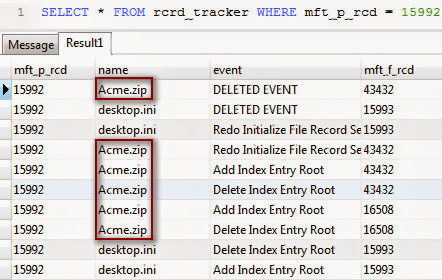 We can validate this by following the steps in the following white paper from our lab that details what temporary files get created from a successful burn. That's it! You could have also looked for deleted entries within the $I30 for the burn directory but in an actual case I would look to the $logfile and $usnjrnl to make sure you get the totality of files burned.